Have you ever read a book that was so compelling, so captivating that it took you deep into the night with your book light on because you just couldn’t put it down? 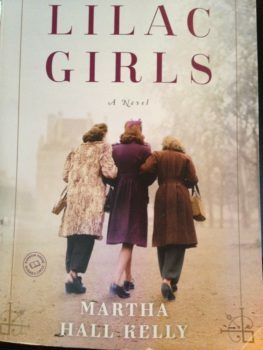 For me, it’s this book: Lilac Girls by Martha Hall Kelly. I have to warn you, it’s not for the faint of heart. It follows three women during WWII and how their paths cross, sometimes good and sometimes not so good. Now, I’ve read other books and seen movies about the concentration camps during that time, and I’ve even visited a couple which was an extremely chilling experience, but nothing consumed me like this book did. Maybe it’s because one of the characters is from Poland. Since I’m 100% Polish, it made me wonder about my ancestry and how they were affected by these atrocities. I never heard any stories from my family, but somehow, someway, someone from my family must have been directly affected. It’s a terrifying thought. Now that I finished this book, I’m taking a little break. I don’t plan on picking up a new book for a couple of weeks. However, today, I am heading to the local library. I just want to sort through the piles, touch a few books, thumb through the pages and see what jumps out at me. Do you have any suggestions? Anything I just HAVE to read? Pretty soon I’ll be ready to take my next adventure through the power of reading. « What Path Would You Take?